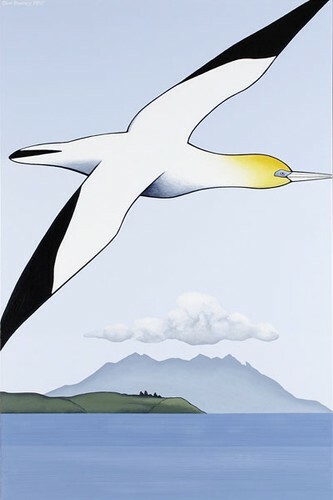 Painter and birdwatcher Don Binney was born in Auckland in 1940 and gerw up in Parnell. From 1958-61 Binney studied at Elam School of Fine Arts in Auckland, gaining a Diploma of Fine Arts. In 1963 he held his first solo exhibition at Ikon Gallery, Auckland, and began teaching at Mt. Roskill Grammar School, leaving in 1966. Binney emerged as a painter during a time when his contemporaries were drawing on art history and landscape painting, creating “a new kind of realism that owes no allegiance to any recent art movement”. Describing himself as a figurative painter concerned with the psychic metaphor of the environment. 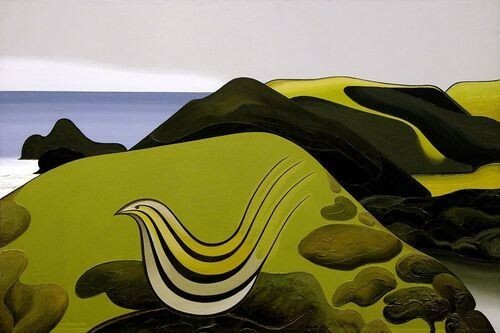 The works for which he is best known depict landscapes with native birds, often inspired by the west coast of Auckland and Northland, with elements of land, sea, sky, birds, and still life. In 1965 Binney was included in a survey show of New Zealand painting held in London, and in the ‘Eight NZ Artists’ show which toured the Australian State Galleries. In 1967 he received a Queen Elizabeth II Arts Council travel fellowship, spending time living in Mexico, London and Australia. He returned to teach at Elam, becoming the senior lecturer in Fine Arts in 1979, retiring in 1998. In 1995 he was awarded an Order of the British Empire for Services to the Arts. 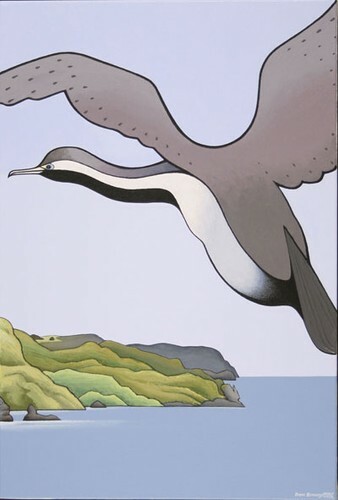 In 2003 Damien Skinner wrote the book ‘Don Binney: Ngä Manu/Ngä Motu — Birds/Islands’, and curated the accompanying survey show which toured the country.